The 2017 FDA Food Code requires MOD or person in charge of a food service operation to become a Certified Food Protection Manager. The strongest asset of a food service industry is a ServSafe® trained associate and the greatest liability is an untrained associate. A Food Safety Training Program for employees and managers is a critical component for restaurants and food service operations. Who should be ServSafe® Certified? The 2017 FDA Food Code stipulates a certified food service manager must be on duty during business operational hours. MOD can monitor associate activities and implement corrective action as required. Best practices dictate that the owner, executive chef, managementincluding key associates, should be ServSafe® certified and perhaps front and back of house associates should at least acquire a Food Handler Achievement Certificate. Food Service operations, especially restaurants, experience high turnovers therefore when advertising or during an interview process, consider requesting that the applicant be ServSafe® Food Certified as a condition of employment. Understanding potential risks and hazards throughout the flow of food requires training associates to make safety the top priority. Published by the National Restaurant Association, the ServSafe® food safety training and certification program is the industry leader, incorporating the latest science based information, real world scenarios and updated case studies. ServSafe® represents the highest standard in food safety training and certification. Accepted in all 50 states, ServSafe® is the most widely accepted food safety training program among local, state and federal health departments. The ServSafe® Certification Program is accredited by the American National Standards institute (ANSI), Conference for Food Protection (CFP) and through the years has awarded over four million ServSafe® Food Protection Manager Certifications. ServSafe® program brings food safety concepts to life, making them more engaging, increasing learner comprehension, and helping lead to increased food safety application on the job and entire workplace. Course material and examination are available in multiple languages. We all realize restaurants, food service and food retail professionals have shift schedules preventing associates from attending full day sessions. Training to Excel offers convenient options to acquire ServSafe® certification status. Whether you're working evenings, split shifts or during the day, Training to Excel can assist with ServSafe® Certification training or just offering examination. Browse the Courses Page for details. On-site stress free self-development in-service sessions free up management to concentrate on important details rather than training associates. Waiter and Waitress fine dining service workshops, key to customer service, improve patron retention while increasing bottom line. Front and back of house In-service training workshops at client's business location. Pre-Board of Health on-site inspection analysis to enhance team member morale, score, and improve overall facility for patrons and associates. 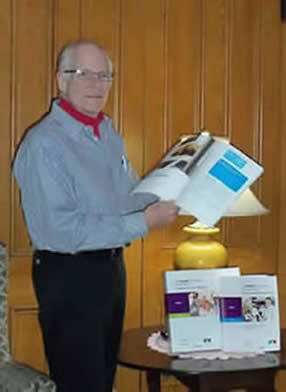 Norm Milot is the proprietor of Training to Excel and a certified ServSafe® Instructor and Registered Proctor. Prior to his retirement from Food Service Management, most of his responsibilities were in the USA and Canada including: Universities, Colleges, Hospitals, Health Care Facilities, Business and Industry, Fine Dining and Military. Norm continues to enjoy assisting Food Service and Food Retail Professionals, Proprietors, Executive Chefs, Chefs, Management, Entrepreneurs, Homemakers, Specialty Food Specialists and Field-to-Fork Farmers to reach their goals. Norm shares his management experiences and qualifications during sessions when solicited. Classes are relaxed and stress free allowing individuals to become actively involved to achieve their ambitions and advancement through education. Consider joining millions of other professionals within the industry and register into a ServSafe® Certification Session offered by Training to Excel. ©Training To Excel - Norm Milot. ServSafe logo used with permission.